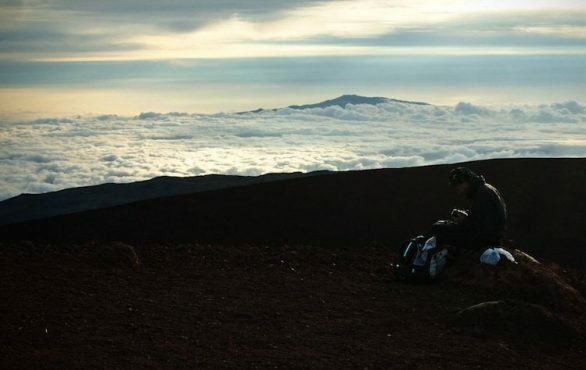 At 4,207 meters (13,803 feet) the dormant volcano, Mauna Kea is the highest point in Hawaii. 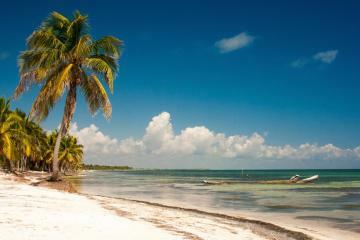 It is also considered the world’s tallest mountain if measured from its base on the ocean floor. 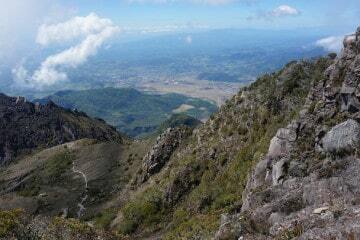 The steep grade of volcanic stones along with the thin air at altitude makes this trek a challenge. 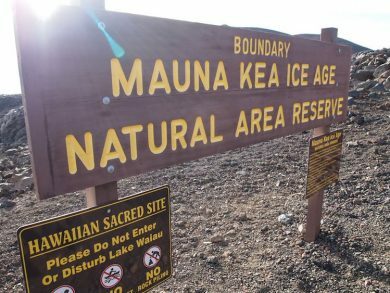 In Hawaiian mythology, the peaks of the islands are sacred and because Mauna Kea is the tallest it is considered the most sacred. According to the ancient law, only high ranking chiefs had permission to visit them. 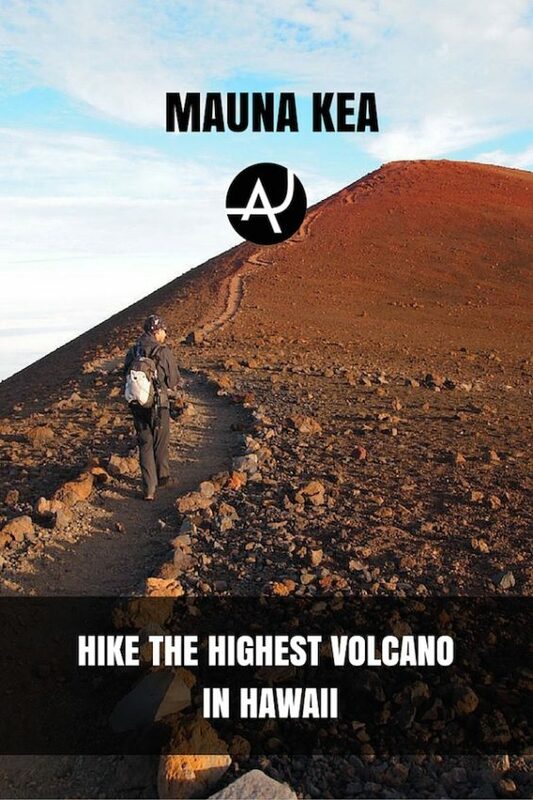 Luckily this has since changed and Antonio and I hiked to the summit when we were visiting the Big Island of Hawaii. 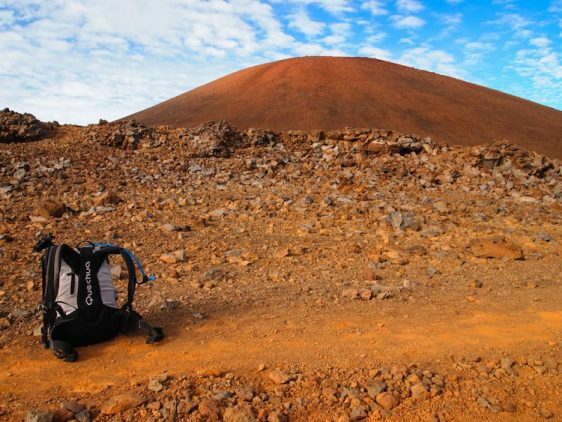 Mauna Kea doesn’t require a multi-day climbing expedition as other high altitude volcanos like the picture perfect Cotopaxi or Chimborazo in Ecuador. Actually, the most popular way to make it to the top of the volcano is to drive in a 4×4. There is a road that reaches just before the summit. 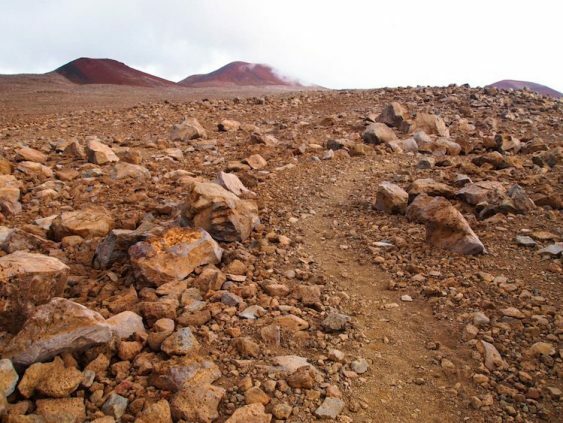 A more fun and adventurous way to get to the top is to hike the Humu’ula trail. This is of course the option we took. We drove to the start of the trail is at the Ellison Onizuka Mauna Kea Visitor Center. You don’t need to pay any fees but you do need to fill out a simple form. The visitor center is open from 9AM – 10PM, everyday of the year. There are no buses that go here so you need to arrange your own transport. Once you drop off the form it’s advised to take some time to acclimate yourself to the altitude. The visitors center is at 2804 m (9200 ft) so it is a good place to do so. 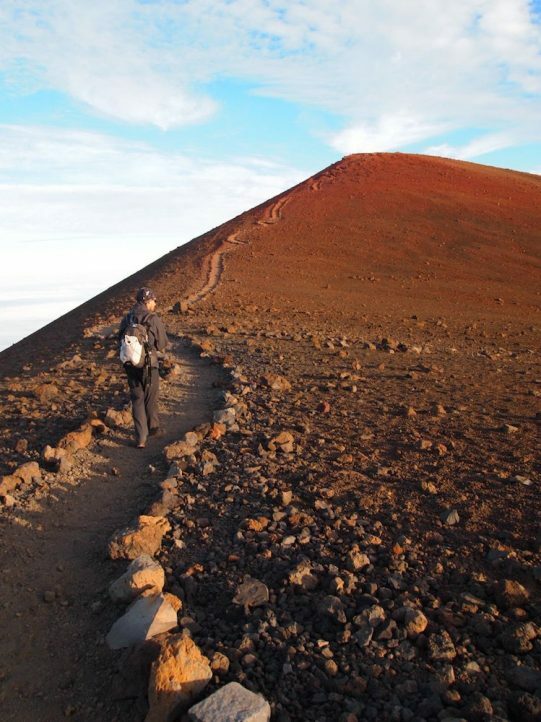 This is a high altitude hike and it’s important to be aware of the risks involved. 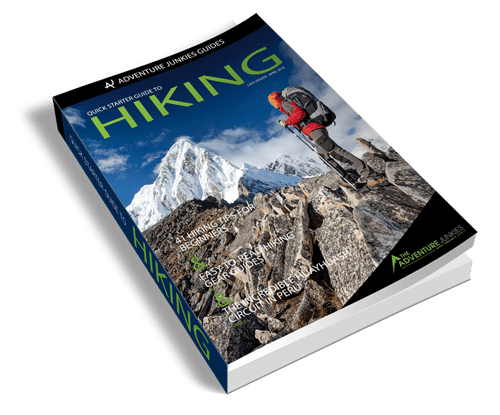 If you aren’t familiar with these risks you can check out this page on the University of Hawaii’s website that gives some basic information about altitude sickness and other problems that can arise. The trail head is easy to find from the visitors center. On the day we hiked, we spent the first few hours surrounded by a dense misty fog. Eventually this cleared and we could see deep orange and red, tall volcanic cones. The road for the cars is almost parallel to that of the trail and at one point you use it to climb to the top. 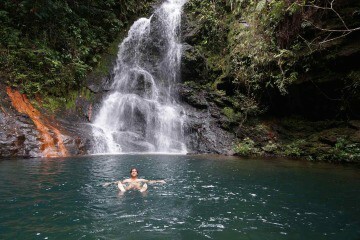 It is a 6 km (6 mile) hike each way and climbs to 1395 m (4576 ft). We maintained a relaxed pace and reached the summit in 6 hours. Mauna Kea does not have one distinct peak but several. 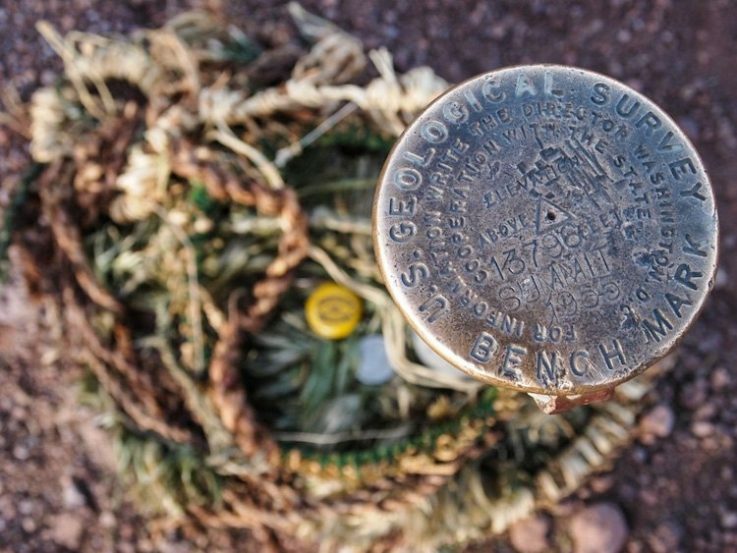 The summit is unhospitable with an air temperature averaging 30°F/-1°C and a low oxygen level (40% that of sea level). If you can fight off the altitude sickness the pain is worth the effort. To the ancient Hawaiians, Mauna Kea was thought of as the home of the gods and goddesses, at the top it is easy to see. All below is surrounded by a blanket of puffy white cumulus clouds and you truly feel at the top of the world. 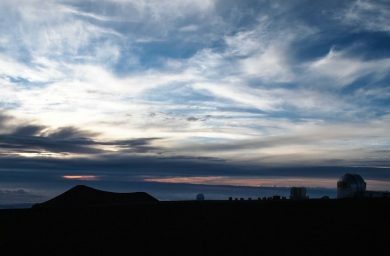 The high altitude, dry environment, and stable airflow of Mauna Kea’s summit makes it one of the best sites in the world for astronomical observation. 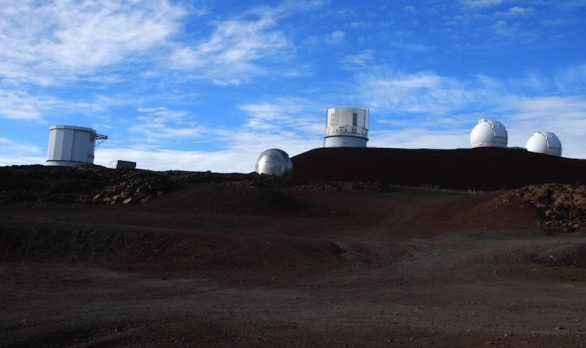 Up here 11 countries have set up infrared telescopes to peer into deep space. Among them is the Keck Telescope, the largest in the world. The Keck Observatory does not offer tours, but it does provide a visitor gallery open Monday – Friday, 10am to 4pm. Here you can view a 12-minute video, informational panels on the observatory layout and science results. There are also two public restrooms here. As the sun begins to set and cast beautiful hues of orange and yellow onto the deep blue background of the sky we make our way down from the summit. We stuck out our thumbs and caught a ride in a Jeep with a friendly couple back down to the visitors station. Although finding a ride can be easy on a busy day as many people are driving up the volcano, it’s important not to rely on this and be prepared with enough water and snacks to make it down on your own power. Bring warm clothes, good walking shoes, and a waterproof jacket. You should carry at least 3 liters of water with you and some snacks for the trail. It takes 5-6 hours to reach the summit. 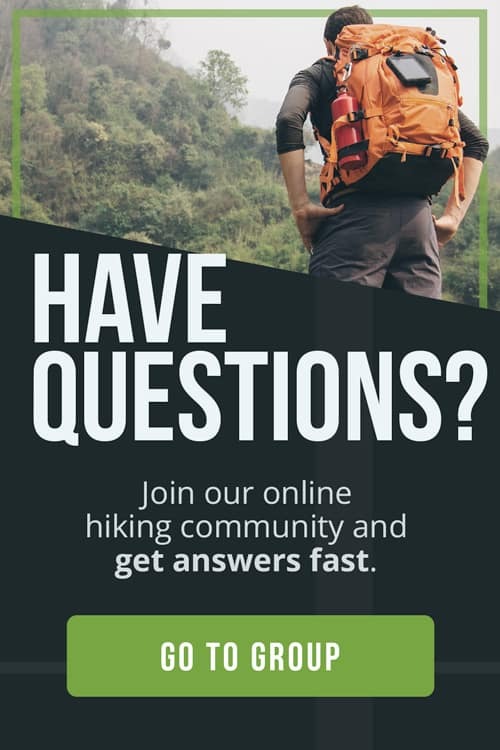 Fit hikers average 10 hours for a return trip. Spring and Summer (April – September) is a great time to go as you as there can be snow and ice during the winter months. Avoid going in January and February as this is when the volcano receives the most snowfall. Take Saddle Road, Hwy. 200, to the exit for the visitor’s center. From the turn-off, it’s about six miles to get there. Watching the sunset, the light reflecting off the clouds is very impressive. Since you can drive to the top there are lots of tourists. Hiking to the summit of Mauna Kea was a great day hike to do while visiting the Big Island of Hawaii. At the summit we were surrounded by a blanket of clouds which truly makes you feel on top of the world. Useful Notes: The weather on the trail can be very unpredictable so plan for the worst. The temperature at summit is very cold (averaging at 30°F/-1°C) even in summer. Also be aware of symptoms of altitude sickness and start to descend if you experience them. Warm clothes, water, food and good walking shoes are essential items for this trip. Also remember to bring sunscreen and a hat to protect yourself from the intense UV rays.